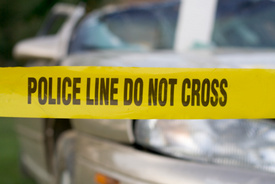 Legal news for Maryland automobile accident attorneys – A vehicle fleeing the scene of a busted drug deal caused a crash with a vehicle carrying an elderly couple, killing one. Father of Baltimore officer dead after 2-vehicle crash. Baltimore, MD (www.NewYorkInjuryNews.com) – A crash between a car carrying fleeing suspected drug dealers and an automobile carrying a couple in their 80s on Wednesday April 28, 2010, left an 86-year-old man dead, as reported by the Baltimore Sun. The victim is the father of a city officer. The officers were conducting surveillance on a black Acura near Parkview and Belle Avenues when they saw what they believed was a drug transaction. The police department’s chief spokesman, Anthony Guglielmi, said the two officers attempted to box the Acura in on foot before the car sped off. By the time the officers got back to their car, the vehicle had disappeared. The department has a policy against chasing speeding automobiles. Police reported the two suspects, tentatively named as Umar Burley, 29, and Brent Matthews, 29, had 35 grams of raw heroin in their car. At approximately a half mile east on Belle Avenue, in a Howard Park neighborhood, the officers saw the Acura had crashed into a fire hydrant and an elderly couple’s vehicle had careened through some hedges into the front deck of a home. Joseph Caldwell, 65, owner of the home, said when he went to check on the crash victims, the woman, 81, was crying for help and her husband, Albert David, was bleeding from the head. David was transported to Maryland Shock Trauma Center, where he was later pronounced dead. David’s wife was reportedly in serious condition. Both suspects have prior handgun violations. Burley has had three drug convictions. Legal News Reporter: Tara Monks – Legal news for automobile accident lawyers.